North Sinai has witnessed unprecedented clashes between armed militias, police and soldiers since the removal of Islamist president Mohamed Morsi. Troops have been deployed at various locations throughout the peninsula and a state of emergency has been declared in Sinai and the Suez Canal region. Authenticated videos of Islamists threatening the army appeared online following a hundreds-strong demonstration in Al-Arish city on Thursday evening, with speakers broadcasting calls to form a war council to combat the army. Activist Hossam El-Shorbagy, who is close to Muslim Brotherhood, told Ahram Online that Islamist militias will not back down from confronting the army because they have flourished during Mohamed Morsi's period in office. Some 20 militia fighters and one soldier have been killed in clashes in recent days, El-Shorbagy said. Ten areas in North Sinai have witnessed clashes, including the Central Security Force camp and a number of checkpoints along the ring road. The airport was closed after being targeted by unidentified armed men who were eventually killed by police. Two Egyptian police officers were shot dead by unknown gunmen in the Sinai town of El-Arish in front of a government building, medical sources said, the latest of a string of security incidents in the lawless region. The police officers were guarding the building when the gunmen shot at them, the sources added. Mosaad Abu-Fajr, a writer and activist from North Sinai, accused the Muslim Brotherhood of causing the violence, because it had held a conference the morning after Morsi was ousted stating the army and police had no place in Sinai. Abu-Fajr also accused factions close to Hamas and the Ezzedine Kassam militia in the Gaza Strip of supporting the violence with funds provided by Brotherhood deputy leader Khairat El-Shater. Abu-Fajr added that the army was responding to attacks and aiming to absorb the terrorist attacks, because it is aware that it is not the right time for broader battles. For Abu-Fajr, as soon as a "democratic rule" is established in Cairo the current violence will end. He blames the security and intelligence institutions for not allowing peaceful demonstrations in Sinai over the lack of security and tunnels to Gaza. 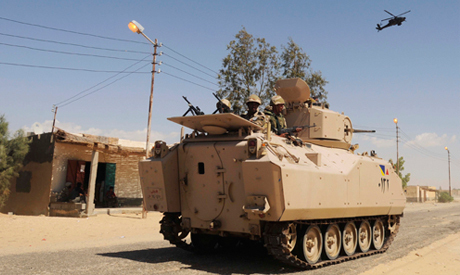 The head of the Union of Sinai Tribes told Ahram Online that Sinai resembles a battlefield. He asked for the army and the political parties to serve the interests of the country and tackle things patiently, wary of the Algerian and Syrian scenarios. General Alaa Ezzedine, the former head of the army's Centre for Strategic Studies, told Ahram Online that the army will soon start a mass operation to target the focal spots of terrorism. He said the main factions are unlikely to last long, especially because the army now has experience from earlier operations. Ezzedine dismissed the Algerian or Syrian scenarios owning to Egypt's strong and well-trained army that will ensure stability, and the people of Egypt. Coordinated efforts are taking place between the police and army, according to Ezzedine, and the operation is likely to take around a month. The people of Sinai are in full agreement with the stance of the armed forces against terrorism, he claimed.